My Pie, which is a kid game on www.bestgames.pk. Miepie is a pink small girl who loves to eat pies and cakes. One day she was happily playing in the park, the crocodile wants to eat her, so Mr. Crocodile was attracted her by a pie. The innocent Miepie saw the delicious cake, she did not think that much to chasing the cakes. Now, let’s help Miepie to get her cake and not let Mr. Crocodile to eat her into his big stomache. Miepie will moving by your arrow key, so you have to let her avoid the crocodile, eat as much cakes as you can, then you can get more scores. Have fun! Princess Sofia is planning to surprise us with something delicious today! it will be a yummy strawberry-apple pie! Will you help little Sofia? 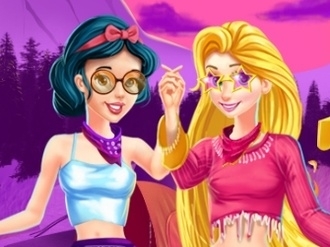 Dress up Rapunzel and Snow White in this Disney Princesses hippie fashion game. Take each one on a shopping spree and spend your budget on buying some cute hippie clothes and accessories. This afternoon Cinderella will have many guests throughout the world. Most of them are kings and princes.The princess is going to make caramel Macchiato which is her favourite. The servants are busy in cleaning the house and cutting the vegetables.She wants somebody who is dedicated and who can be there until she finishes preparing the ice cream pie. Be with the princess till the end. Assist her to prepare the ice cream tasty. Besides, follow the instructions. Have fun with the princess. When you are done with the cooking, join her for lunch. Though many have come, you are her chief guest. Thank you for helping the princess.